Thanks to my lovely, talented, creative, and generous cousin, Erica, my blog will soon be updated with a whole new look!! I would like to thank Erica for donating her time and energy to making this happen for me. She is such a talented, incredible woman who has her own wonderful blog called erica miss america. It is such an awesome blog full of yummy recipes (she eats gluten-free and it's amazing some of the creations she comes up with. You would never even know it's gluten-free.. her food so appetizing and delicious!). She's also a runner -- she just completed her first full marathon in Philadelphia this month. So proud of her! Moreover, she does yoga and makes beautiful jewelry. 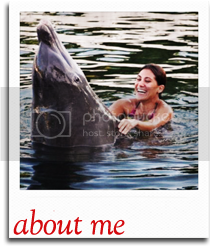 Her blog is so inspirational and wonderfully written. Plus, it's full of great cooking ideas as well as workout/running posts, and all kinds of great stuff!! If that wasn't enough, she makes beautiful, customized jewelry. 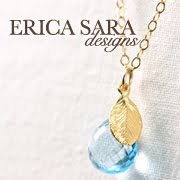 Check out her stuff at Erica Sara Designs. I love her work. Her pieces are classy, timeless, and elegant. Moreover, she loves working with people to create personalized pieces! Anyway, I'm so excited that my blog is getting this upgrade and I wanted to thank Erica! Thank you!!! I'm working on your design this week & can't wait to launch it!! !